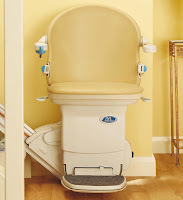 Castle Comfort Stairlifts offers top brand stairlifts, keen prices and fast installs for all those seeking stairlifts in Wilmslow, Cheshire. And all work comes with our no-quibble guarantees and famous customer service satisfaction. Weatherfield and Wilmslow couldn’t be more different, yet two of the long serving members of Coronation Street – Britain’s favourite soap – live in Wilmslow, Cheshire. Real life and screen life are somewhat different no doubt! Are you a resident in Wilmslow? Are you leading a double life? Apparently cheerful and getting on with things but secretly frustrated at no longer being able to climb those stairs? Castle Comfort Stair Lifts would love to help you. How could we assist? Well we are the national agents for all stairlift manufacturers so not only can we supply but we can also give you an unbiased opinion about the best one for you. Want to know more? Please watch our founder Keith’s short video above and then please give us a ring on 01625 886 599. Yes William Roache who plays Ken Barlow and has starred in Coronation Street from its first episode in 1960 lives in Wilmslow as does his colleague Simon Gregson better known to all as Steve McDonald. Both characters have grown up on the street as it were, Gregson is close to completing his 22nd year. He was picked whilst still at school to play one of the McDonald twins. Just like Weatherfield is a suburb of Greater Manchester so is Wilmslow; it is just 11 miles from the centre of Manchester and just 7 miles from Macclesfield the home of Castle Comfort Stair Lifts’ Cheshire office. Unlike the soap suburb, Wilmslow is renowned for its famous and rich residents mainly footballers and businessmen. Back in 2005 is was reportedly the home of over 100 millionaires including businessman Peter Jones – not the ‘Dragon’ but the founder of the Emerson Group. At that time he was thought to be worth in excess of £460 million, somewhat richer than either the Queen or Mohamed al-Fayed owner of Harrods. Wilmslow is also home to a number of footballers such as Manchester United players, Nemanja Vidic and Park Ji-Sung as well as Alex Ferguson, Man U’s manager. Arch rival Manchester City players Joleon Lescott and David Silva have both chosen Wilmslow as their home too as has Titus Bramble who plays for Sunderland. Just 6 miles away in nearby Prestbury you’ll also find a host of well-off residents who like to earn a bob or too kicking a ball about including Wayne Rooney, Robbie Savage, Carlos Tevez, Stan Pearson, Wes Brown, Owen Hargreaves and with different ball skills ‘Freddie’ Flintoff. Robbie Savage who last played for Derby Country was labelled as the ‘dirtiest player in the Premier League’ and now presents 606 on BBC Radio Five Live. He has gone on to shine in Strictly Come Dancing on BBC TV. Dancing with Ola Jordan he has reached Wembley again – he has played at Wembley before striking up 39 caps for the Welsh national team. If you wish your dancing was still as hot as Robbie’s but actually making the stairs is the first hurdle, why not give Castle Comfort Stair Lifts a call. We’ve got an office in Cheshire where are team will be happy to advise you - 01625 886 599. Take a look at our information, use the £50 voucher – even the canniest and richest businessmen will take advantage of money saving offers – and consider a new or reconditioned stairlift from us now. What’s the attraction of these parts? A short tour around Wilmslow will be enough to explain: expensive houses – prices of around £2million aren’t uncommon, designer shops, cafes and restaurants all suggest the ‘Cheshire lifestyle’! Its neighbour Alderley Edge is similar and has attracted a few big names of its own. It was the home of the Beckhams before David went to play for Real Madrid; and remains home for Rio Ferdinand, Michael Carrick, Christiano Ronaldo, Mikael Silvestre, Andy Cole and Stoke’s own Peter Crouch! Actress and ex Coronation Street star, Denise Welch and Richard Fleeshman also late of Coronation Street live here alongside Stuart Hall well-known as host of It’s a Knockout. It is also home to two of the band members of New Order/Joy Division, Bernard Sumner and Peter Hook. Alderley Edge and Prestbury encompasses village life with proximity to the urban conurbation of Manchester just 12 and 18 miles away respectively for access to transport links. The name actually comes from old Anglo-Saxon for ‘mound of a man called Wighelm’ – not very inspiring! But the discovery of Lindow Man one of the most important iron-age finds in the country again gives Wilmslow that exclusivity. Lindow Man can now be seen at the British Museum. Wilmslow is part of the ‘Golden Triangle’ with Alderley Edge and Prestbury for on-going house price rises and its affluence. 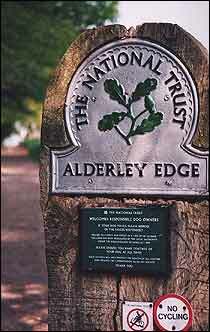 The Edge in Alderley is a geological term for a red sandstone escarpment which rises 215 miles above see level and forms a horseshoe. Stormy Point is a popular place with visitors to view the surrounding countryside of the Cheshire Plains and the Peak District. It is a National Trust Site. Engine Vein is a natural fault in the rock which is rich in copper and other minerals and was excavated by Bronze Age miners and later the Romans. A small 19th century estate covering 276 acres of beautiful countryside with rolling hills, the gardens at Hare Hill are home to a collection of exotic plants and wire sculptures. This pretty village dates from Saxon times and its name is thought to mean ‘Priest’s fortified enclosure’. Probably chosen for this purpose as it stands on fairly high ground for a clear view of the River Bollin. In the 19th century it was big in the silk industry so many of the houses in Prestbury were built as factory or weavers’ cottages. Wayne Rooney’s pile is somewhat bigger than these! Nearby Grade I listed Adlington Hall still owned by the Legh family has parts of this historic building open to visitors on published dates. It’s worth taking a look at the 15th-16th century Great Hall and timber framed courtyard. Any special occasions coming up? You can hire the Great Hall or the hunting lodge! If getting up and down those stairs would be event enough for you, then Castle Comfort Stair Lifts are the event organisers you need! Give us a call to discuss what you need and find out just what we can do. Our local office number is 01625 886 599. Come on Robbie we love you, you can get to Blackpool - even if you did look like you needed a stairlift to get up those stairs after that mauling by Craig on "Strictly" tonight !